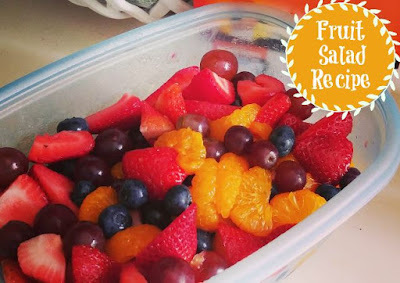 Simple and frugal fruit salad recipe that is sure to be a hit anywhere you take it! For this all you need to do is cut and clean the strawberries and add them to a bowl. Mix in washed blueberries and grapes. Open a can of mandarin oranges drain it and add it in as well. Simple and yet refreshing! You can add any fruit really, raspberries, pineapple chunks, kiwi, etc!